"The sale of this item may be subject to regulation by the U.S. Food and Drug Administration and state and local regulatory agencies. This unit has been used. Let us earn your loyalty! stands to reason that issues will arise occasionally. The speakers are in mint conditionand sound great. Woofer only - not complete speaker- 12". 1960's Fisher XP-7C. I was quite impressed with its sound quality. It is not a heavy duty speaker, but easily capable of 75 watts per channel. I was using it with a 120 wpc Proton AA-2120 power amp & it worked just fine. Item contains the following: SPEAKER. May show minimal wear and tear from normal use. this is not a defect in the unit. typically processed within 48 hours of closure. We are closed on weekends. Orders are. No Accessories Included, 2 Speakers Only. Item is pre-owned but it's in excellent working and cosmetic condition. One of the corners of one box has a small peel. Any nicks or dings are noted in photos. Overall the speakers are in great condition! Tested and working! Includes exactly what you see pictured - nothing more, nothing less! THE PRICED REFLECTS ALL OF THIS! THE PHOTOS CLEARLY SHOW THE CONDITION OF THE ITEM(S)! IF YOU EXPERIENCE PROBLEMS WITH YOUR ITEM(S) WE WILL WORK FAIRLY WITH YOU TO HELP RESOLVE THE ISSUE QUICKLY. These are about as close to mint as you'll find used. Condition is excellent. A nice Fisher center speaker. Wood is in nice shape as is the cover. Fully tested and working properly, excellent condition. These speakers were lightly used and in excellent condition. These speakers sound great. Physically the speakers are in great condition with no dings, scrapes, breaks, ect. Included is ( 1 ) Fisher WS-C424 Center Channel Speaker and (2) Fisher WS-R424 Speakers. Hooked up sounds good! Ask if you have any questions. 3 speaker set with 2 square WS-R424 and 1 rectangle WS-C424 speaker with woofer and tweeter. FISHER WS-424 3 PIECE SURROUND SOUND KIT. EACH SALE GIVES 10% TO LOCAL CHARITY FEEDING THOSE IN NEED! Unable to remove front covers. Have been tested and do work. Unable to locate model number. Item has been tested and is in great working order. No accessories are included. They were each tested with audio and found to be working. They sound good! Adjustable stands/mounts are included. Plain & Simple! We will help to resolve any issues quickly and fairly. This item is in good condition and fully functional with blemishes from normal use. 1960's Fisher XP-7C mid range. 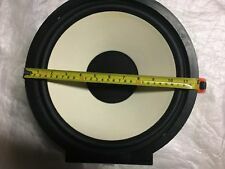 Mid range only - not complete speaker- 5 1/4". Front Grill Only- not complete speaker. Used-very good condition-plastic grill front needs a little cleaning. Manufacturer: Fisher. This speaker is used and is in good working order. One corner has a large chunk missing (see pictures). Does not include audio cables, and any other speakers or accessories. Electronics Cafe specializes in used electronics. Manufacturer: Fisher. Electronics Cafe specializes in used electronics. Every inquiry is of utmost importance and we treat it as such. We strive to provide 5-star service in every category you can rate us on! 3.75" Tweeter. 12" Woofer. Sealed acoustic suspension design cabinet, 8 ohm. Pair 3” Fisher SA80464-2 tweeters speakers pulled From Works Fisher STV-880-Last Picture Digital Compatible Speakers System. (Music power 120 watts). Sold as is. All from use and handling. Nothing that effects the quality of the sound. (2) WS-R424 speakers. All 3 have been tested and have a great sound. No wire would be provided. 3 black speakers: (1) ws-c424 center speaker. 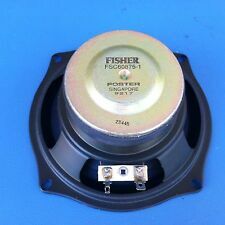 fisher Speakers St 9428. Condition is Used. Shipped with USPS Parcel Select Ground.